I want to humbly thank all the amazing young people that jammed into the Harvey theatre this morning and yesterday morning. Your enthusiasm is inspirational! It has been quite an honor to be a part of this show, it has allowed me to explore my roots, reconnect with old friends (what up Toni B. and Reborn!) and collaborate with a new generation of AMAZING performers. To all-thank you, thank you, thank you. 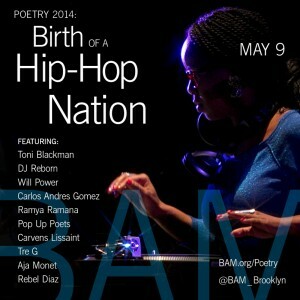 This entry was posted in NEWS and tagged BAM, Birth of a Hip Hop Nation, Brooklyn Academy of Music, DJ Reborn, Hip Hop Theatre, Poetry, Spoken Word, Will Power. Bookmark the permalink. Trackbacks are closed, but you can post a comment. I loved the piece you did at BAM. You are a true artist and talent. Any chance that particular piece of work is on video somewhere? I want to watch it again! I was at the performance on may 9th at BAM. I was wondering if any of the performances were recorded because I really enjoyed it and would love to see it again!